The Samsung Galaxy Note 9 is expected to be unveiled on August 9th. Consumers will reportedly get their first opportunity at reserving a unit on August 14th, with the launch of the phablet allegedly taking place on August 24th. Just yesterday, we showed you some leaked photos of the phone, including one live snapshot of the device. 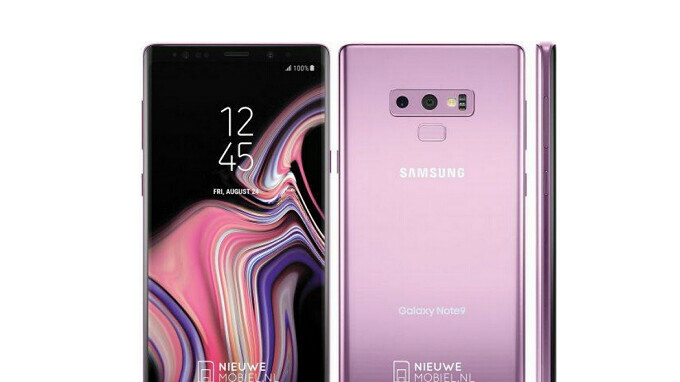 Now, we have a press render of the Samsung Galaxy Note 9 dressed up in Lilac Purple. The Galaxy Note 9 is expected to hit the market carrying a 6.3-inch Super AMOLED display, with a resolution of 1440 x 2960. In the U.S. and China, the Snapdragon 845 Mobile Platform should be under the hood. Elsewhere, it looks as though the Exynos 9810 chipset will drive the device. 6GB of RAM is said to be inside along with 64GB of expandable storage. A pair of 12MP cameras are rumored to adorn the back, and a front-facing 8MP camera for selfies is reportedly included. Previous leaks point to the Galaxy Note 9 being powered by a nice-sized 4000mAh battery. A revamped S Pen comes with the Galaxy Note 9 right out of the box, featuring Bluetooth capabilities, and the unit has an IP68 certification rating. A recent leak from Samsung Poland revealed that the Samsung Galaxy Note 9 could be priced at $960 USD, just under the magic $1,000 bar. The color options, according to the same leak, will be Black, Blue and Purple. A previous leak stated that the three color options available when the Galaxy Note 9 launches will be Black, Purple and Gray. Different markets might have different hues available when the device launches next month. It seems like the body is a bit wider than the Note 8. That's a good thing. I think it's just because of the poor image. I think it will the same as the Note 8 only a few mm shorter. The CAD dimensions put the Note9 at 1.5 millimeters wider than the Note8 and 0.5 millimeters shorter. Sounds negligable, but you'd be surprised how much of a difference that makes visually. I was genuinely surprised when I picked a 5.2" smartphone after using a Nexus 5 (4.9") for months! Looked noticeably bigger; despite the minimal size difference on paper. Weird! G'Day! Since the blue Note comes with a yellow S-Pen, I've been theorizing on what other combinations they might release. It'd be cool to see the lilac purple one come with a silver S-Pen & the black come with a red one. Not sure what they would do with the brown and the gray. That would definitely be cool, but I could see a feature like that (perhaps similar to Moto Maker) adding on to the price of what will already be an expensive phone. I'd only be interested if it didn't cost anything extra & didn't take a lot of extra time to ship. Both of those things would more than likely be the case though. And then have it hidden inside the phone 99.9% of the time ? Why bother ? It's called personal preference. People love their phones certain colors, but most keep them in cases 99.9% of the time. Doesn't stop them though. Why do you bother. You have never even had a note phone so you have no clue. You also have no clue how much someone uses the pen. I use it multiple time a day for something. QHD screen, good camera, good performance, a handful of fluff features, a battery that might last 1 or 2 days maybe, and a big screen. Same recipe for a "flagship" smartphone we've seen over and over again for years. Wake me up when something new actually arrives. Unless you're expecting some Tony Stark or some Wakanda $#¡! you just mentioned the recipe for ALL flagship phones that are going to arrive. Looks better then any others and no hideous notch. It’s ugly S9 plus looks better and hideous notch still sell more than all Galaxy’s. Huawei by Porsche Design, Galaxy S9 (I would have said S8, but there's something really wrong with the fp position), Essential, XZ2, Note 7 - just to name a few Android phones that look better than that hideous piece of junk. I noticed that a lot of Android phones are using notches; too bad they are not using ears just like iPhone X does. It's a more refined version of the Note 8. What exactly about it looks rushed to you? The camera cutouts, the finger scanner location is fine as proven on the S9. Just feels like a Note 8S. Hopefully it has the 4000mAh battery. I don't think there's any users that will do that many handwriting that they need to go to the edge. Drawing? you can always drag your canvas around. I've use 2 notes in the past, I don't think I ever write more than 15 words at once. Most of time I just use S-pen for quick note (without unlocking phone or while using other apps), I'm not a fan of handwriting recognition on samsung keyboard, Swipe work faster for me. Oh looking who is here making his rounds. You make your rounds on every Apple article, so don’t go pointing fingers.